While the std_logic is great for modeling the value that can be carried by a single wire, it’s not very practical for implementing collections of wires going to or from components. 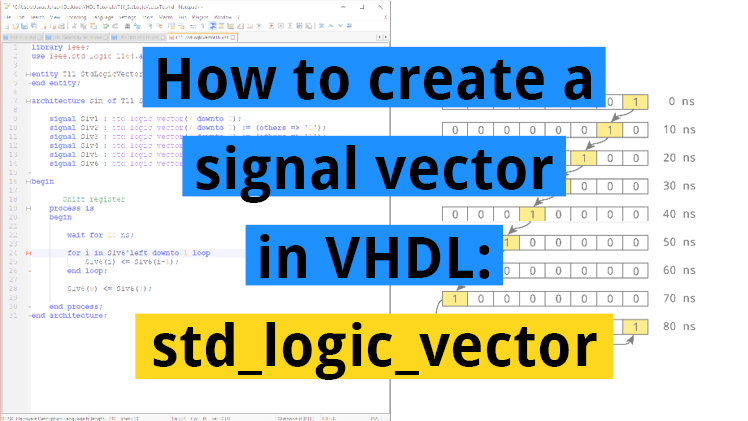 The std_logic_vector is a composite type, which means that it’s a collection of subelements. 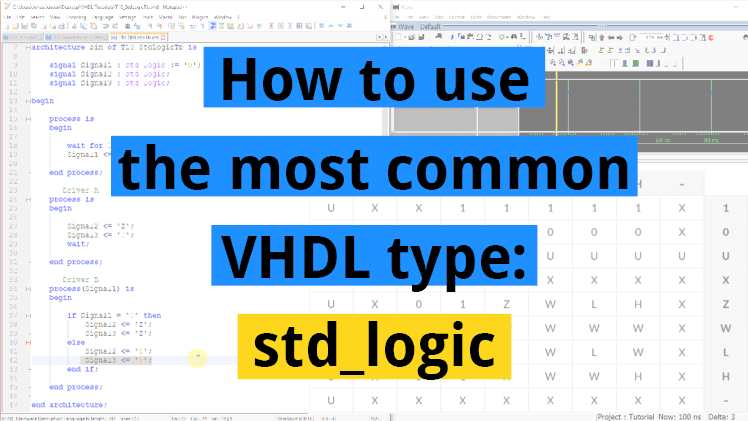 The most common type used in VHDL is the std_logic. Think of this type as a single bit, the digital information carried by a single physical wire. 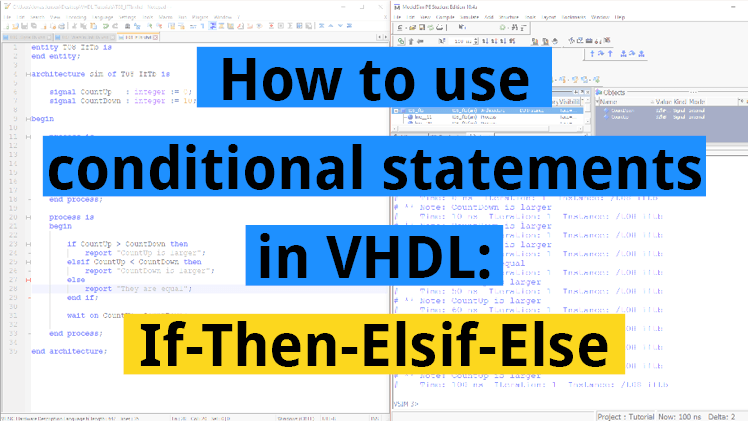 The std_logic gives us a more fine-grained control over the resources in our design than the integer type, which we have been using in the previous tutorials. You should always use a sensitivity list to trigger processes in production modules. 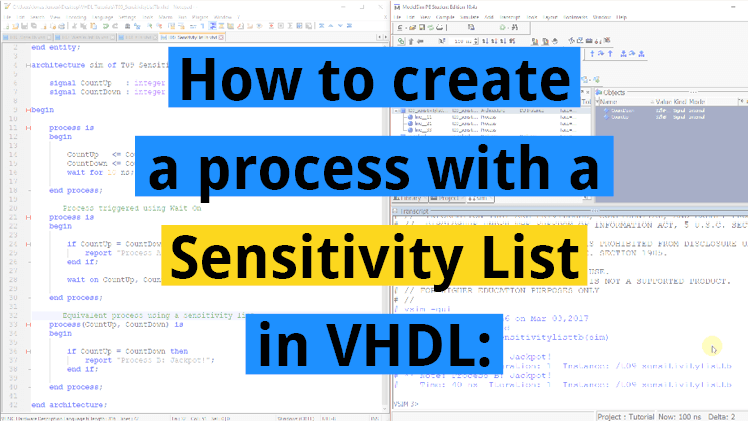 Sensitivity lists are parameters to a process which lists all the signals that the process is sensitive to. If any of the signals change, the process will wake up, and the code within it is executed. 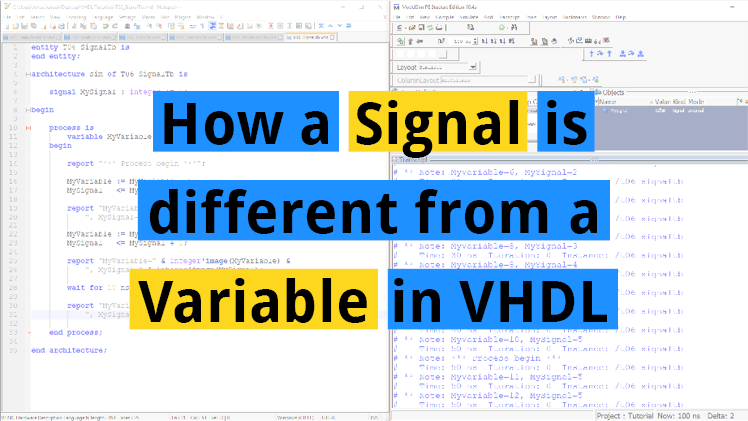 In the previous tutorial we learned the main differences between signals and variables. We learned that signals have a broader scope than variables, which are only accessible within one process. 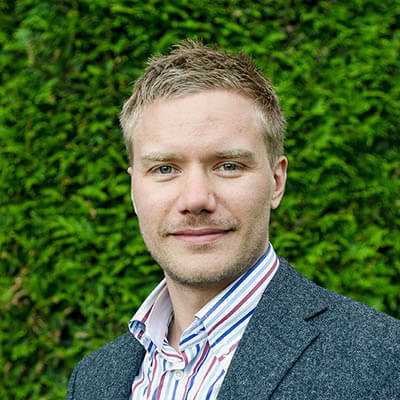 So how can we use signals for communication between several processes? We have already learned to use wait; to wait intinitely, and wait for to wait for a specific amount of time. 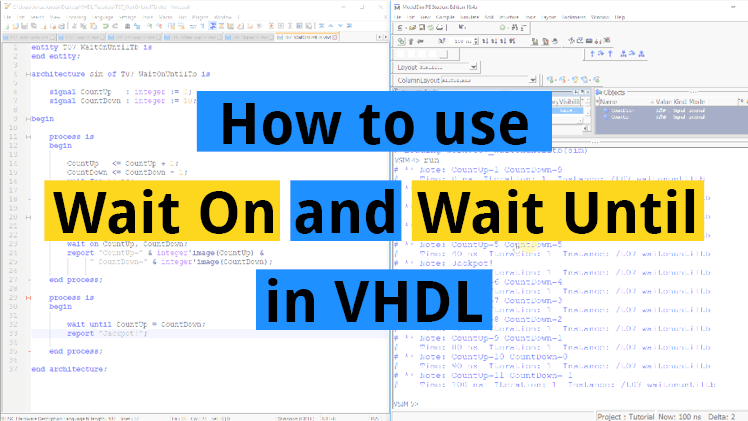 There exists two more types of wait statements in VHDL. 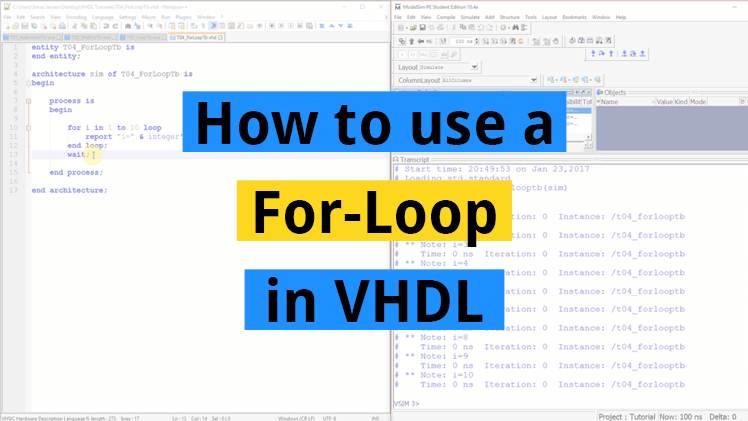 So you have completed the first part of the Basic VHDL Tutorial series. Congratulations! 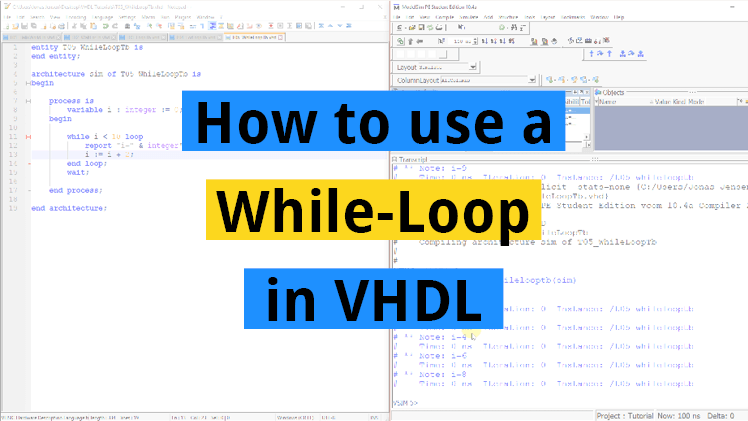 You are only hours and hours and hours away from becoming a genuine VHDL whiz. But you have completed the first step, and that’s the most important part right now! In the previous tutorial we learned how to use a For-Loop to iterate over an integer range. But what if we want a more detailed control of the loop than just a fixed integer range? We can use a While-Loop for this. The While-Loop will continue to iterate over the enclosed code as long as the expression it tests for evaluates to true. Therefore, the While-Loop is suitable for situations where you don’t know exactly how many iteration will be needed in advance. In the previous tutorial we learned to create an infinite loop by using the loop statement. We also learned how the break out of a loop by using the exit statement. But what if we want the loop to iterate a certain number of times? 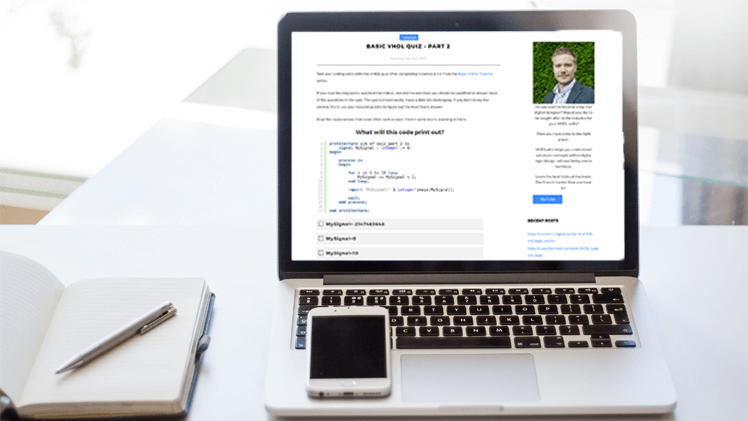 The For-Loop is the easiest way to accomplish this. 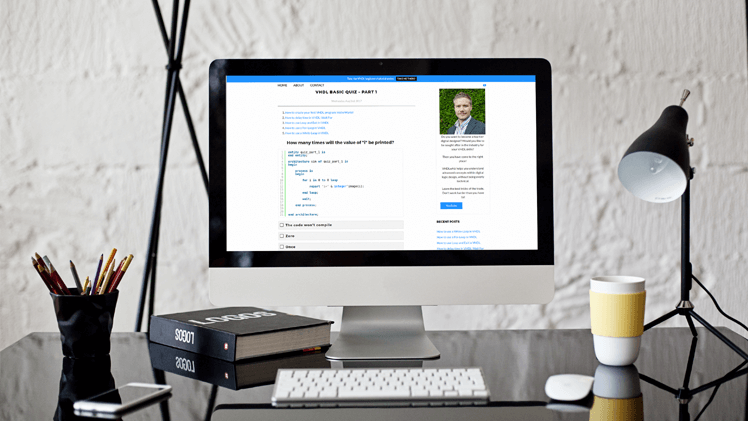 The For-Loop allows you to iterate over a fixed range of integers or enumerated items. The item belonging to the current iteration will be available within the loop through an implicitly declared constant.